Saturday was a beautifully warm and sunny day in Alfeld, somewhat south-west of Hanover, Germany. But I did not really get to see much of the sun that day. 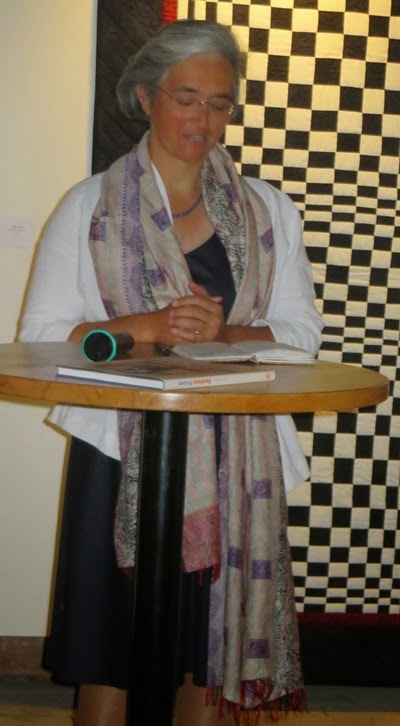 We – Mary Schliestedt, Gabi-Julia Weimer, both their husbands and I (my husband’s kind of help was the child-minding at home!) 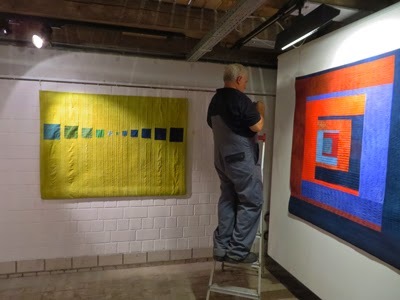 – spent almost eight hours downstairs in the basement of Fagus Werk, hanging our exhibition. 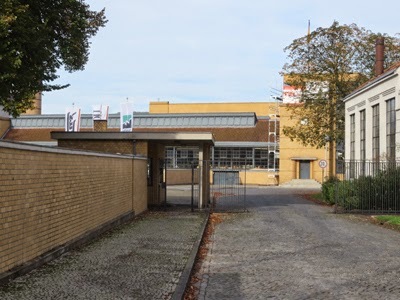 Fagus Werk, a factory for shoe lasts, was the first building planned and executed by Walter Gropius after setting up as an architect in 1911. It has been beautifully restored for its centennial, and was awarded the UNESCO World Heritage title. 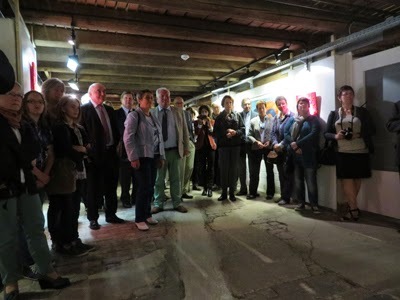 In one part of the building, which houses an exhibition on the history of the building, art exhibitions are also possible. 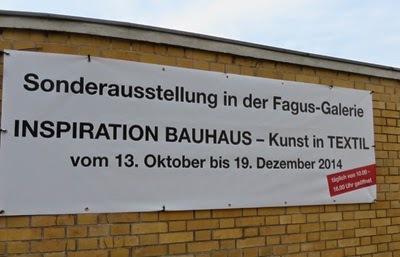 Because of the Bauhaus association of the building, we had chosen the title “Inspiration Bauhaus – textile art” for our joint exhibition, and have spent the better part of one and a half years working towards this date. 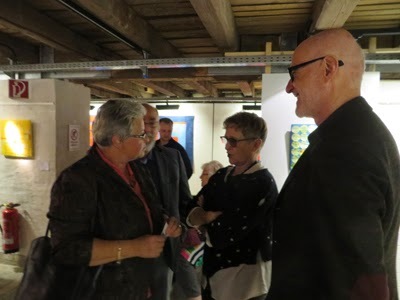 Mary’s husband, who had never hung an exhibition before, seemed rather surprised on Friday evening when I tried to tell him that his expectation that we would be finished by noon was highly amibitious... The decisions of where to place the almost eighty pieces that are on display were taken by just before one o’clock. 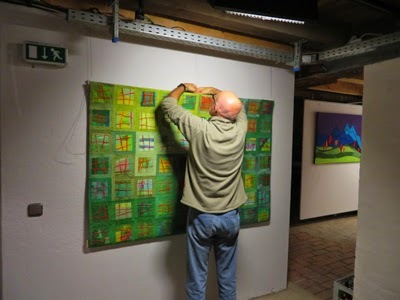 But it took all afternoon after the lunchbreach to finish the fine-tuning of lights, straightening the quilts, determining the distances, putting up the signs with information. Thanks to the tall men and the fact that the ceilings in this unique kind of venue were on the lower side saved us a number of trips up the ladder - two more worthy candidates for the title "supporting quilter husband". The janitor of Fagus Werk, Mr. Dogan, was a very considerate and patient helper, too. He adjusted all the lights for best illumination, even suggested some changes in arrangements. 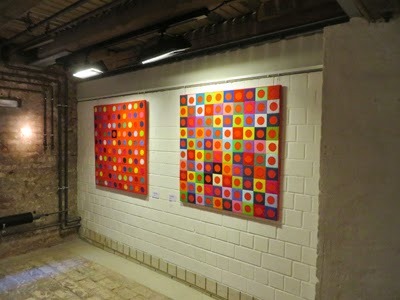 In the evening, we had a cohesive and beautiful exhibition on the walls. And on late Sunday morning, the guests arrived. in which I mentioned the position and role of many of the female Bauhaus students, and congratulated me on stressing this fact. She thought probably most of the attending visitors were highly surprised that there had been female students at Bauhaus at all! I left Alfeld in the afternoon, after once again looking at this inspiring building. The site has a slightly magic feel to it, I think. 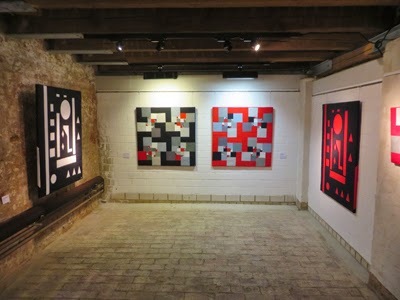 I am really happy with our exhibition there. It will be on display until December 19, open every day from 10 a.m. to 4 p.m. 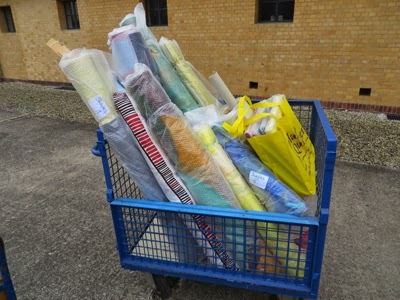 The quilts look really exciting. This is just stunningly beautiful. I live in SW Florida and wish I could see it. Do you have anymore photos? Wow! They look great together. That venue is wonderful with all the space available for work. I hope you get many visitors. It looks fantastic Uta. I'm sure that so many people are going to enjoy it too. Looks like a great exhibition! The Bauhaus women were fantastic - indeed I was just thinking about the weavers the other day. I hope that your show is successful. The exhibition is simply amazing. I regret not being able to see it in person. It looks really good, well spaced and well lit ... all in all, well considered - and well received!